The 1st Step is Understanding Deer Behavior: Deer are afraid of anything new. They travel in groups and fawns are taught where to eat by elders. They browse primarily at dusk and dawn and are selective feeders. Deer are animals of prey, so they have acute senses of sight, smell and hearing to help them survive. In fact, their field of vision has a range of 270 degrees! Deer are adaptable and territorial. They have successfully adjusted to living in a shrinking habitat that is being acclimated by humans. Deer live within a certain range, so they will not roam forever… they know there limits and their familiar territory. The best things to take from this understanding of deer behavior is that they like familiarity. This is the reason that many experts will suggest altering your deer repellents or deterrents on a frequent basis. Use a certain repellent for one month and then a different one the next month. Maybe even mix in a physical barrier such as a fence or a motion-activated sprinkler or ultrasound device the next month. There are lots of options out there! Choosing Deer Resistant Plants: If you are looking to redo your landscaped areas or are planning to go to the nursery for some new plants to replace those that have died, it is a good idea to choose plants that are more deer resistant. This is especially the case if you know that you have a lawn and garden that are frequently visited by deer. There are many more deer-resistant plants than you might first think. Here are some of the more popular ones for our area: English Ivy, daffodils, hyacinth, holly, spruce, boxwood, ferns, many ornamental grasses, lavender, peonies, iris, marigolds and more. A large list of DEER RESISTANT PLANTS has been provided by the Penn State Extension for your reference. Please note that you may still want to protect these plants with a repellent of some sort, because deer can be forced to eat these less desirable plants when times are tough or when the plant is convenient. Feeding the Birds without Feeding the Deer: Bird feeders can be a reliable food source for deer. It is important that if you have a bird feeder in the backyard that it be kept out of reach from deer. Similarly, it is important that the areas around the bird feeder be kept clean. 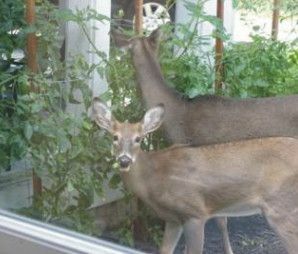 If deer are accustomed to coming to your garden because of an ill-positioned bird feeder, then they are more like to stop by and sample some of your plants. To help with this situation, it is often recommended to use a bird feeder that can be suctioned to the window, or one that can hang out of the reach of deer. We sell a variety of hooks for the deck, windows, or walls that can help you accomplish this. Again, there was much more talked about, but we felt that these were some of the most popular topics regarding deer behavior. Thanks for reading everyone!